“While evidence that IBP [increasing-block pricing] incents energy efficiency is absent, the evidence is clear that IBP is a key driver behind the distributed solar PV movement in California. A big part of explaining why economic growth, and sales tax revenue, were lower than expected? “Having successfully not spent the money he didn’t plan to spend, he’s now treating that $1 billion as a sign of the Liberal government’s gift for fiscal restraint. It’s an old trick. When the federal Liberals were enjoying budget surpluses in the early 2000s, they’d build in multibillion-dollar contingency funds to make the surpluses seem smaller. At the end of the year, they could overspend on some new goodies and still come in with better numbers than had been “predicted” when the contingency funds weren’t all spent. One reason I have this alternative blog is the possibility that premise is wrong. A sometimes very annoying part of writing is it causes more reading. Two of the dullest things I’ve recently read were bad legal rulings regarding wind at Ostrander Point and the Darlington nuclear new built environmental assessment. I was motivated to read the Darlington decision due to a lawyer’s implication (twitter) the judge considered the impacts of nuclear units within a context of options. This was not so. Lawyers and judges are, in general, annoying. Generalizations being a little cowardly, let me be specific: Diane Saxe is annoying. We hear from folks on the ground that, once projects start running, many neighbours have privately expressed pleasant surprise that the turbines cause them no difficulty and are easy to get used to. Nocebo effects only happen if people believe in them. Here’s the problem with the statement. Electricity wasn’t installed; the capacity to generate electricity was. That equipment to generate electricity from renewable sources is probably not made with renewable sources (think steel – and the sources to produce energy in China). To illustrate, think Tesla and Nevada. Tesla has been shopping for a site to build an enormous battery factory, primarily for its electric cars which it often links to solar power in marketing. We won’t know until tomorrow, at the earliest, what price will be paid to lure Tesla to Nevada or, given Harry Reid’s influence in Congress, how the subsidies will split between Nevada and the federal government. We do know Tesla didn’t choose Nevada because of an early mover “renewables” advantage the state had previously paid for. 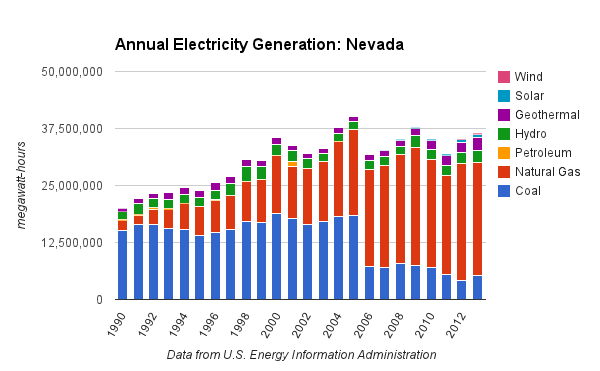 Nevada gets over 80% of its electricity generation from fossil fuels. The green Tesla gigafactory will be built with the same energy that builds casinos. That may not end up being the only similarity.